Fundamentally, wealth is the availability of abundant survival resources. 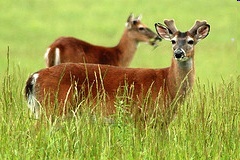 Hillsides full of tall green grass are a deer’s wealth. More grassy hills can support more deer. More deer eat more grass until overgrazing causes deer to starve. The deer population drops, grass rebounds, deer population rebounds, grass dwindles… and so on. This is the perpetual boom to bust to boom cycle of nature. I assume the cycle applied to humans initially. Advances in tool technology made hunting and gathering more productive and secure. This increased resources and the human population rose. Tool technology has now made us the dominant species on this planet, the top of the food chain, and our numbers continue to increase. When does the bust phase of nature’s boom or bust cycle kick in? When, like the deer, we have totally consumed all resources? If all our tools disappeared tomorrow, food and other resources would plummet and our population would return to that of Paleolithic times. Let’s face it, without tools — from the stone ax on up — we are a rather wimpy species. We would be lion food. Speaking of lions, a total boom or bust cycle can’t occur with deer if lions are allowed to keep deer population in check. We ‘solved’ that problem for our species by killing all the lions, wolves, bacteria, virus… any predator that would help keep our population in check. Oops! As people become more comfortable and secure, a primary result of wealth, the human population appears to trend downward rather than rising as it would for deer. People have less children. If this trend holds up in the future, world populations will plummet as more and more of the world’s population becomes wealthy enough to feel comfortable and secure.